It hardly seems credible today that a nineteenyear- old boy, just commissioned into the Seaforth Highlanders, could lead a platoon of men into the carnage of the Battle of the Somme. Or that, as the machine gun bullets whistled past and shells exploded, he could maintain his own morale to lead a platoon, keeping its discipline and cohesion, in spite of desperate losses. 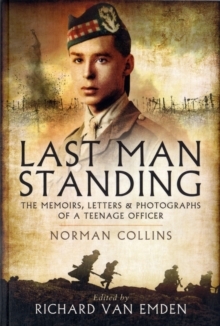 Norman Collins, the author of this superb memoir, was this remarkable man.Using Norman's own words, Last Man Standing follows him from his childhood in Hartlepool to his subsequent service in France. The book also covers such shattering events as the German naval assault on Hartlepool in December 1914 when, as a seventeen-year-old, Norman was subjected to as big a bombardment as any occurring on the Western Front at that time. Norman's love for, and devotion to, the men under his command shine out in this book and his stories are gripping and deeply moving. They are illustrated by a rare collection of private photographs taken at or near the front by Norman himself, although the use of a camera was strictly proscribed by the Army. Most of the images have never been published before.